Found her on the 1860 Buffalo Ward 7, Erie, New York census (img 25) as Barbara Fingel age 34. Found her on the 1910 Ripley, Tippah, Mississippi census (dist 97 img 13) as Ida N. Finger age 40. Found her on the 1920 Ripley, Tippah, Mississippi census (dist 62 img 4) as Ida N. Finger age 53. Found her on the 1930 Ripley, Tippah, Mississippi census (dist 4 img 12) as Ida Finger 64. Found her on the 1900 Freedom, Polk, Tennessee census (dist 95 img 19) as Maggie Finger age 18. Found her on the 1920 Center, Polk, Tennessee census (dist 101 img 1) as Margrite Finger age 38. Found him on the 1850 Vernon, Clinton, Ohio census (img 1), age 15 born Ohio. There is a Samuel J. Austin on the 1860 Adams, Clinton, Ohio census (img 23) age 25, born Ohio, married to Eliza E., age 23, born Ohio, with a son William H., age 2. Unknown if this is him. REED CORNERS - Funeral services for Homer F. Blakesley, 73, Reed Corners, will be held at 2 p. m. Sunday in the family home and at 2:30 p. m. in the Reed Corners Federated Church. The Rev. Robert Hanley, pastor, will officiate. Burial will be in Gorham Cemetery. Mr. Blakesley died Wednesday in his home. He is survived by his widow, Mrs. Lucy Hopkins Blakesley; three daughters, Mrs. Ellen Borden, Reed Corners; Mrs. Charles Campbell, Penn Yan, and Mrs. Philip Wyffelf, Canandaigua; four sons, Charles, Stanley, Merrill, Riverside, Calif., and John and Robert, both of Reed Corners; a brother, Charles, Reed Corners; two sisters, Mrs. Pearl Dinehart, Branchport, and Mrs. Stella Connolly, Phelps; 13 grandchildren and three great-grandchildren. Found him on the 1880 Jerusalem, Yates, New York census (dist 218 img 33) as Henry H. Blakesley age 5 months. Found him on the 1900 Italy, Yates, New York census (dist 135 img 21) as Homer Blakesley age 20, farm laborer. Found him on the 1910 Italy, Yates, New York census (dist 174 img 14) as Homer Blakesley age 30, farmer. Found him on the 1920 Italy, Yates, New York census (dist 175 img 13) as Homer F. Blakesley age 40, farmer. Found him on the 1930 Potter, Yates, New York census (dist 16 img 16) as Homer Blakesley age 50, farmer. Found her on the 1880 Ironton, Lincoln, North Carolina census (dist 101 img 24) as Ellen Beal age 43. Father, mother born North Carolina. Found her on the 1900 Beloit Ward 5, Rock, Wisconsin census (dist 162 img 23) as Ethel Bull age 5. Found her on the 1920 Beloit Ward 5, Rock, Wisconsin census (dist 95 img 19) as Ethel Pohl age 25. Found her on the 1930 Beloit, Rock, Wisconsin census (dist 14 img 7) as Ethel Pohl age 35. Found her on the 1900 Barrington, Yates, New York census (dist 132 img 1) as Mattie Carey age unclear. Found him on the 1915 Barrington, Yates, New York state census (AD1 ED1 img 2) as Mattie Carey age 15. Found her on the 1920 Potter, Yates, New York census (dist 185 img 8) as Mattie Tears age 20. She is married to George R. Tears and both of them are living in the household of his parents Everett and Eva Tears. Found her on the 1930 Potter, Yates, New York census (dist 16 img 11) as Matie Tears age 30. Found her on the 1900 Newton, Catawba, North Carolina census (dist 46 img 18) as Gracie M. Cline age 5. Found her on the 1910 Newton, Catawba, North Carolina census (dist 30 img 22) as Gracie Cline age 16. Found him on the 1920 Civil District 3, Loudon, Tennessee census (dist 151 img 6) as Cecil H. Cochrane age 24, single, living at home. Found her on the 1900 Buffalo Ward 18, Erie, New York census (dist 141 img 3) as Mary Felix age 9. Found her on the 1905 Buffalo Ward 13, Erie, New York census (E.D. 02 img 14) as Mary Felix age 14, at school. Address: 731 Jefferson. Found her on the 1910 West Deptford, Gloucester, New Jersey census (dist 138 img 34) as Alice Finger age 5. Found her on the 1920 Ripley, Tippah, Mississippi census (dist 62 img 9) as Bertha Finger age 5. Found her on the 1930 Ripley, Tippah, Mississippi census (dist 4 img 21) as Bertha Finger age 16. Bottendorf Lutheran parish records via Ulrich Stöhr, letter Aug. 23, 1988. Subsequently, yr of birth changed to 1758 in letter of 6 Nov 1991. Christopf F., was born in 1758 in B. as son of Konrad Finger and Barbara C. Lange and later was "adopted" by his childless godparents in W. There's still an oral tradition according to which that godfather Christoph Kuehling has carried his godson in his arms home to W.
This is the same Christoph Finger in 'Die Geschichte Willersdorfs in sieben Jahrhunderten' by Ulrich Stöhr, 1994, p. 110. The story of the godfather carrying his godson in his arms from Bottendorf in retold there, in German. Death year from this source. Death place may be Willersdorf instead of Bottendorf as I earlier believed. Again I have looked at Heinrich's journals to be sure I transcribed his information correctly and the following is as he wrote it. There is much that puzzles me as to his spelling of Heinrich and sometimes Henry or the other spelling of Henrich that I see in your records. Also the first Christopher married a Miss Kuhling (dots over the u) which was the same last name of his Uncle who adopted him. And then married a second Miss Kuhling. May have married 1st cousins? Heinrich's brother Christopher who immigrated to Boston married a Miss Eckel there (no first name) This Christopher was born in 1824. My great grandfather Heinrich Finger who was the founder of my family here in America wrote of the oldest member of his family known to him. first known was... Christopher Finger born in Bottendorf but adopted at age 4 by his Uncle Christopher Kuhling (Kuhling always spelled with 2 dots over the u) Christopher Kuhling lived in Willersdorf. Christopher although adopted retained his last name of "Finger" Christopher Finger at age 18 married a Miss Kuhling (again 2 dots over the u) Who was but 16 years old and they had 4 sons Michael John Jacob & Christopher (there is no further mention of these 4 sons). Then his wife died at some time. He then married a second Miss Kuhling (same spelling with dots). They had 1 son and 3 daughters. Christopher died in 1822 and his 2nd wife died in 1838. The son was Henry who inherited the 66 acre farm b. 1797 (and was the father of my great grandfather Heinrich Finger.) The daughters were Anna Marie, Eva Elisibeth, & Gertrude Elisibeth. Henry married in 1821 to Elisabeth Imhof b. 3/20/1820. Henry died in 1869 and Elisabeth died in 1877. They had 9 children John, Christopher, Eva Elisabeth, Anna Gertrude, Anna Maria, Henry b. 1837 (my great grandfather). 3 children died in infancy. The eldest John inherited the homestead Christopher emigrated to Boston in 1844. Eva Elisabeth married John Fackiener Anna Gertrude married John Merle Anna Maria married a school teacher John Jost Henry emigrated to New York 1857. All above notes are from John Vanko. Father: Charles Edgar FINGER Jr.
Found him on the 1930 Hamburg, Erie, New York census (dist 411 img 1) as Eugene M. Finger age 9. Found him on the 1910 Lincolnton, Lincoln, North Carolina census (dist 69 img 23) age 2. Found him on the 1920 Lincolnton, Lincoln, North Carolina census (dist 106 img 15) age 10. They were married by Rev. Josiah Leonard. - The Saugerties Telegraph, 13 Aug 1853. 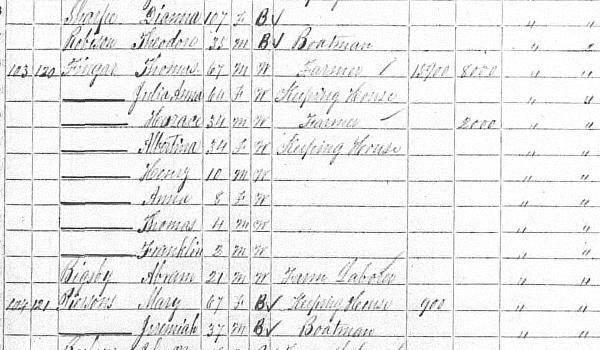 Found her on the 1900 Justice Precinct 5, Brazoria, Texas census (dist 5 img 35) as Mattie I. Finger age 10. Found her on the 1910 Justice Precinct 5, Brazoria, Texas census (dist 11 img 18) as Mattie Finger age 19. The name recorded at his birth was Walter V. Finger. On his WWI draft registration card his name is John Walter Valentine Finger, and he is employed as a tool maker by the Baird Machine Co.
Found him on the 1900 Bridgeport, Fairfield, Connecticut census (dist 37 img 14) as Walter V. Finger age 10 months. Found him on the 1910 Mt Vernon Ward 3, Westchester, New York census (dist 65 img 15) as Walter J. Finger age 10. Found him on the 1920 Stratford, Fairfield, Connecticut census (dist 485 img 27) as Walter Finger age 20, single, living at home, machine shop. Found him on the 1900 Newton, Catawba, North Carolina census (dist 46 img 5) as Evert A. Huneycut age 5. Found him on the 1920 Winston-Salem Ward 3, Forsyth, North Carolina census (dist 98 img 61) as Everett A. Honeycutt age 25, machinist, tobacco factory. His death certificate lists his occupation as Salesman, Furniture Ret. Co.
Found her on the 1900 New Haven, New Haven, Connecticut census (dist 389 img 12) age 4. Found him on the 1860 Saugerties, Ulster, New York census (img 194) as Jno. H. Jones age 37, laborer. Found him on the 1870 Saugerties, Ulster, New York census (img 76) as John Jones age 47, works in paper mill. Found him on the 1880 Saugerties, Ulster, New York census (dist 152 img 77) as John H. Jones age 57, works in iron mill. Found him on the 1900 Saugerties, Ulster, New York census (dist 132 img 9) age 76, widower, living with his daughter and son-in-law, Jeremiah and Viola Finger. Father, mother born England. Came to the U.S. in 1835. Found him on the 1860 Woodstock, Ulster, New York census (img 8) age 6. Found him on the 1870 Kingston, Ulster, New York census (img 239) as George Lasher age 16. Found him on the 1870 Gallatin, Columbia, New York census (img 10) as Harmon Lyle age 2. His family is living next to the family of Egbert Finger, the first cousin of his future wife. Found him on the 1900 Pine Plains, Dutchess, New York census (dist 17 img 12) as Herman Lyle age 31, farm manager. Also in his household is Gertrude V N Lyle age 54, aunt. (Born Dec 1845). Found him on the 1910 Gallatin, Columbia, New York census (dist 11 img 1) as Herman V. Lyle age 41. Farmer, dairy farm. Found him on the 1920 Gallatin, Columbia, New York census (dist 16 img 9) as Herman V. Lyle age 50. Farmer, dairy farm. Found him on the 1930 Gallatin, Columbia, New York census (dist 14 img 5) as Herman Lyle age 62, farmer. Found him on the 1870 Campobello, Spartanburg, South Carolina census (img 37) as William McMillan age 9. Thomas Munson, (titles of Sir and in this country Capt.) Born about 1612. Married Joanna-ppy- born about 1610, she died 12-13-1678, age 68, he died 5-7-1685, age 73, was carpenter, Civic Officer, and in Military Service, Congregational, residence in Hartford and New Haven, Conn. In 1637 (age 25) he first became known as resident of Hartford who performed military service in the Piquot War. Forty-two of the ninety men composing Mason's renowned army were of Hartford. At daybreak June 5th, 1637 occured the Historic battle, eight miles Northeast of New London. He received plot of land at Soldier's Field, Hartford, for his services. Aug 6th, 1643, Chosen Sergeant of Trayned Band and Fran, Newma Ancient March 1643, the "Artillary company" is organized and he is chosen Sergeant also retaining his office in band. March 7th 1661, Chosen Ensign but declined and then finally accepted on April 29, 1661. Munson Records In Part And Concerning Geo. E. Munson and Sisters Beatrice May Belle and Josephine Melvina. Found him on the 1880 Benton, Yates, New York census (dist 215 img 3) as Wilkie C. Owen age 15, At School. Found him on the 1910 Benton, Yates, New York census (dist 173 img 4) as Wilkie C. Owen age 45, farmer. No wife is listed although the census says he has been married 1 time. Also in his household are his mother Emily M. Owen age 67, widow; Howard W. Owen, son, age 15; Wilhelmina Werly age 13, neice; and Cora Werly age 36, sister. Found him on the 1920 Benton, Yates, New York census (dist 174 img 17) as Wilkie Owen age 55, single, living with his widowed mother. Found him on the 1910 Charlotte Ward 4, Mecklenburg, North Carolina census (dist 104 img 22) age 1 month. Found him on the 1920 Charlotte Ward 4, Mecklenburg, North Carolina census (dist 144 img 24) age 9. Found him on the 1930 Charlotte, Mecklenburg, North Carolina census (dist 27 img 44) age 20, single, living at home. According to his death certificate he was a salesman for the Goodyear Tire & Rubber Co.
Found her on the 1860 Germantown, Columbia, New York census (img 18) as Julia A. Fingar age 54. Last name varies, Shuttes. Also seen, Juliann Shultis, and a Sylvia Shuttes. Found her on the 1930 Hamden, New Haven, Connecticut census (dist 136 img 40) age 2.